The two most common forms of estate planning trusts are the living trust and testamentary trust. A testamentary trust is a trust created under a will, which means the testamentary trust does not actually exist until the will takes effect. The will creates the trust and transfers property to the testamentary trust. Unlike a testamentary trust, a living trust actually springs into existence during the creator's lifetime, which means the trust becomes operative before the will takes effect. The trustor, meaning the person who creates the living trust, transfers property to the living trust during his lifetime. Any property held by the trust at the time of the trustor's death is unaffected by the trustor's will because the trustor's will only relates to property owned by the trustor. Therefore, a living trust supersedes a conflicting will. When a person passes away, that person's will springs into effect in a legal proceeding called probate. The purpose of the probate process is to disseminate the deceased person's property according to the terms of the deceased's will. Probate does not apply to property held in a living trust since trust property is not legally property owned by the deceased person. Therefore, a will that purports to disseminate property held in a living trust has no legal effect on that trust property. A common estate planning technique is the use of a will and testamentary trust together. Under this technique, the will is called a pour-over because the will simply pours property into the trust then the terms of the trust dictate the long-term handling of that property. During probate, the terms of the pour-over will supersede the terms of the testamentary trust. However, once probate has occurred and the property has been transferred to the testamentary trust, the terms of the trust then supersede the now-obsolete terms of the will. The will has no effect after probate is complete, but the trust generally continues to operate and control the property long after probate ends. Fiduciary powers, or powers to act on behalf of another, may be granted to both executors and trustees under a will. 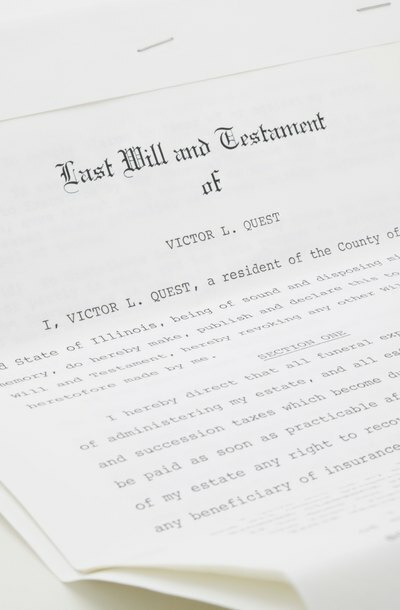 Under most wills, an executor, also referred to as a personal representative, will be named in the will and appointed by the court upon probate to fulfill its terms. If the will also establishes a testamentary trust, or a trust created by the will, then a trustee will also be designated to fulfill the terms of the trust.